Made from heavy industrial steel, powder coat paint for superior and chemical resistance. All drawers have full length action slide with 38mm thick wooden table top which is sutiable for working vise. 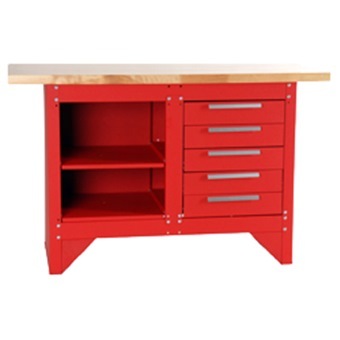 W x D x H 54.0" x 20.0" x 34.0"
5 Drawers W x D x H - 17.6" x 16.5" x 4.0"
2 Shelves (Adjustable) W x D - 17.7" x 17.3"